Health Promotion and Disease Prevention: Logically Different Conceptions? The terms “health promotion” and “disease prevention” refer to professional activities. But a “health promoter” has also come to denote a profession, with an alternative agenda compared to that of traditional public health work, work that by some is seen to be too medically oriented, too reliant upon prevention, risk-elimination and health-care. But is there really a sharp distinction between these activities and professions? The main aim of the paper is to investigate if these concepts are logically different, or if they are just two extremes of one dimension. The central concepts, health promotion and disease prevention, are defined, and it is concluded that health promotion and disease prevention are logically distinct concepts, although they are conceptually related through a causal connection. Thus, logically, it is possible to promote health without preventing disease, even if this is not so common, in practice, but it is not possible to prevent disease without promoting health. Finally, most health promoting interventions target basic health, not manifest health, and often also thereby reduce future disease. In the 1970s there was the (rediscovered) “insight” that health problems could not be solved by medical means alone . In 1974 Marc Lalonde [20, p. 63 ff], then Minister for Health in the Canadian government, introduced the idea of a “health field concept”. It emphasized four components, viz. human biology, environment, lifestyle and health care organization, each of which influences health in different ways [1, 11, 41]. These ideas led to the emergence of the “new public health”, with a much broader view of the aims of public health [1, p. 254]. This was opposed to traditional public health work, “an approach demanding a knowledge of medical disease prevention” [32, p. 4]. One older strategy that became part of this new trend was health education, i.e., the planned activity aimed at producing “health- and illness-related learning” [50, p. 24]. This often meant trying to change health behavior. In relation to this the idea of a “lifestyle approach” became popular, not least with conservative and neo-liberal politicians, and this tended to turn into “victim-blaming”, i.e., making the individual responsible for her own health problems, an idea which is much too simplistic, as later research has shown [1, 16, 28, 41]. Thus, the “new public health” often resulted in a focus on the behavior and the “lifestyle” of individuals rather than on the broader socio-economic determinants of health. Since the end of the 1980s, and with the production of the Ottawa Charter for Health Promotion, there has been further focus on political factors and on the environment, but most notably also on community action, participation and empowerment [21, 55]. Since then there has been an emphasis on enabling or supporting factors, and on the individual’s own (right to) control over her health and life [1, 11, 21, 55]. It is in this context that we must understand the sharp distinction that is sometimes made between health promotion and disease prevention, and the appearance of a supposedly new practice or profession, that of health promoter, a profession that (by some) was thought to be a radical break with the older public-health tradition’s emphasis on disease prevention in a more narrow sense. It appears, then, that there are some crucial differences, conceptual and practical, as well as ideological, between the activities of disease prevention and health promotion. Disease prevention is often associated with “the medical model”, a model that is said to be “mechanistic” and “reductive”, i.e., it focuses on the biology of the person, her organs or functional parts, rather than on the whole person [50, p. 21]. Health is consequently defined as the absence of disease, where diseases are normally seen as bodily or mental dysfunctions [2, 3, 17, 51, 52]. The focus of the model is often on “disease prevention among high-risk individuals” [21, p. 21], or risk behavior , and on “early detection and management” (1, p. 250), i.e., on individuals with asymptomatic and undiagnosed diseases. Today this might, for example, include “[m]olecular and genetic approaches to the control of disease” (ibid., p. 251), as well as more traditional attempts to detect early stages of, say, cancer. Often, as noted, the focus is on so-called risk groups. At other times it seems that the whole population is the target, for example vaccinating all children at a certain age [24, p. 158 ff].). But whether or not the focus is on the whole population or on groups, it is disease, not health, that is the central focus of prevention, or so it is said. Interventions influenced by the medical model are, moreover, often seen as expert-driven, top-down approaches, associated with “negative definitions of health” [21, p. 21], i.e., with the absence of disease or illness. They often involve doing something to the population, directly or indirectly, and are, in the best of cases, driven by a paternalistic zeal, i.e., they are initiated for the benefit of the recipients. This approach often also includes treatment of disease and illness, especially in the earlier stages of the disease process, e.g., secondary and tertiary prevention. Furthermore, this medical approach, it is claimed, mostly leaves reality as it is, and people “as they were”. Treated people are sent back to their “normal life”, a life that might be the cause of the problem [43, pp. 1–2]. When it comes to health promotion there are competing suggestions as to what the concept should mean . We will focus on a few ideas, particularly on those that stand in contrast to those associated with disease prevention. Health promotion is primarily concerned with “positive health”, and with well-being. “Health-promotion activities strive to increase one’s state of health, whereas disease prevention strives to maintain a status quo”, as MacDonald puts it [27, p. 27], in Korp [18, p. 29]. The definition of health most frequently used is the one delivered by the WHO , i.e., health as the “state of complete, physical, mental and social well-being and not merely the absence of disease and infirmity” . This definition is seen as “holistic”, which usually refers to the person as an acting and experiencing agent (within a context), in distinction to focusing on organs or parts of the individual, as with a reductionist medical model. The major inspirational document behind this approach is the Ottawa Charter for Health Promotion . According to the document, health is “the process of enabling people to increase control over, and to improve, their health” (ibid., p. 1). The definition of health, however, was altered in this charter, no doubt because of problems finding practical guidelines from the old one. Health is now seen as a “resource of everyday life” (ibid., p. 1). It is a positive concept emphasizing “social and personal resources, as well as physical capacities” (ibid., p. 1). What is meant by resources is not developed further, and neither is it satisfactorily explained how this new definition of health is related to the older one, i.e., health as well-being, which the charter apparently still holds on to. The influential idea of “empowerment” is also introduced in the charter. Empowerment is the approach that should be taken in order to promote health, and it is by some even seen as the “raison d’être of health promotion” [50, p. 1]. The definition of empowerment is, however, more or less synonymous with that of health promotion (at least as it is formulated in Health promotion glossary [38, p. 16]); it “is a process through which people gain greater control over decisions and actions affecting their health”. The central idea of a “process” appears to refer to a bottom-up, participatory approach which takes its starting point in the problems as perceived by the individual, group or community itself [38, 48]. So, the idea is that health promotion is primarily concerned with promoting positive health, especially through health-enhancing, or salutogenic [14, 25], factors, as opposed to preventing disease through the elimination of pathogenic factors. Even though some writers endorsing health promotion do mention disease prevention, or even include it as part of health promotion, most such writers appear to associate disease prevention with something entirely different, something not on their agenda, and, thus, do not discuss the issue or relate it to health promotion. Brubaker, perhaps, speaks for them when he claims that “health promotion occurs after health stability is present and assumes disease prevention and health maintenance [sic] as prerequisites or by-products. The latter are not the primary focus, however” (in [29, p. 110]). There are a range of professions concerned with promoting health, for example public health officers, environmental health officers, health educators, health planners, and health communicators [32, 50]. They often work outside of the health-care and medical settings, in the community. The relatively new profession of health promoter also belongs to this group. It is a profession mainly concerned with positive health—usually achieved through empowering community projects—and, in line with the WHO definition from 1986, not (primarily) with disease and illness . Despite these seeming differences, the question whether there are two (or more) different kinds of professional practices, health promotion and disease prevention remains. Now, some, like Ashton and Seymore, might regard this question as unnecessary. We already know what health promotion is (and perhaps also disease prevention). Let us just get down to business (in [43, p. 28]). However, as pointed out by Seedhouse (ibid., p. 27 ff), clarifying the central concepts used is important for any profession, for theoretical, practical and ethical reasons. There is, then, a problem in that neither aim, health promotion or disease prevention, seems clear and that many professional activities appear to do both at the same time (Cf. [12, p. 56. ff]). For example, the definition of health as well-being gives little guidance when it comes to what to do, since it is so wide, and neither does the idea of strengthening of resources, since it is too vague. Furthermore, what disease is, is rarely sufficiently clarified, and (partly for this reason) the important explication of the relation between the concepts of health and disease is mostly missing. Moreover, disease prevention, as we have seen, is often narrowly conceived, as risk elimination, e.g., removal of pathogens, screening and vaccinations, or treatment. Thus, there is a general vagueness about the goals of the entire enterprise, of public health and health promotion [16, 43], having to do with a lack of clarity regarding the central concepts, namely health (promotion) and disease (prevention). Should they be defined in terms of (the presence or absence, or the increase or decrease, of) ability, capacity, resource, functioning, normality, well-being, suffering, welfare, quality of life, happiness, sense of coherence, autonomy, freedom, empowerment, or control, or some combination of these (see also [45, 46] for attempts at clarifying this issue)? MacDonald [27, p. ix] even fears that health promotion might become a “Theory of Everything”. 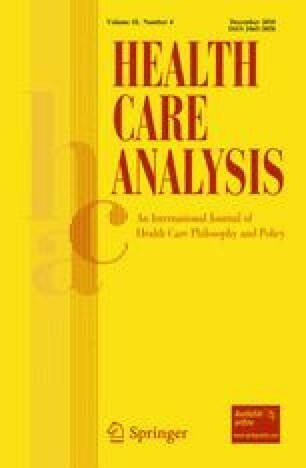 The result of this obscurity and vagueness about the goals of public health is that the means we use might be the wrong ones, and since what goals we (as professionals) should pursue is an ethical and economic question, the issue also spills over into the political sphere and the question of what policies we should pursue. The main aim of the paper is to investigate, within a public health context, if it is possible to distinguish between health-promotive and disease-preventive strategies and practices. The answer (partly) has to do with the concepts of health and disease. Are they logically different (and only causally related), or are they just two extremes of one dimension? However, the answer also has to do with the practices and activities of professionals. Are the methods and strategies used in promoting health different from those used in preventing disease, given that the concepts that describe the goals of these practices are logically different? The strategy in this paper will be to clarify what health promotion and disease prevention are, by looking at the concepts involved. In order to do this we first need to define the concepts “health”, “disease”, “promotion” and “prevention”, and second, to draw out the logical implications and relations of the concepts “health promotion” and “disease prevention”. In short, following strict (and well-argued) definitions of the concepts discussed might help clarify some of the confusions that exist in the field of public health today. However, finding useful definitions of the concepts discussed does not mean that all problems vanish. It is likely that some of the conflicts regarding whether we should practice health promotion or disease prevention have to do with other things, for example what (contributing) causes of ill health are the most important to tackle (e.g., individual behavior or social forces, i.e., proximate causes or “the causes of the causes”, ), what populations we should direct our attention to (e.g., the whole population or risk groups, ), and what methods we should use (e.g., top-down, or bottom-up, strategies, [9, 22]). There might in the end be other questions in need of answers. If these practices turn out to be logically different, are the means to reach them also different, or are they wholly or partly the same? In a second paper , taking the logical conclusions of this paper as a starting point, I discuss if we can, in practical terms (using examples like health information campaigns and vaccination programs), promote health without preventing disease and vice versa. In the following sections I will provide definitions of the central terms used, namely promotion, prevention, health, disease, health promotion and disease prevention. Let us start by analyzing the concept of “promotion”. There are several aspects of the concept. Promotion is about furthering, bringing about, or maintaining, some sought-after process or state of affairs. Usually what is promoted is something positive, but I see no logical problem in promoting negative things, e.g., to promote smoking cigarettes, even if this usage of the concept is more unusual. Promotion is an intentional activity, not something that comes about by chance [33, 35]. For example, from the fact that people with better education and higher salaries live longer and have better health we cannot draw the conclusion that universities or (some) employers are engaged in health promotion (unless this is an intended policy with the aim to further health). Furthermore, anyone can be involved in promotion activities, not only professionals or politicians. There seems to be little point in limiting, by stipulation, promoting activities to certain groups. This also means that not only professionals but also laypersons can be engaged in promoting activities, e.g., for their family and friends. Note that a person can also promote something for or in herself . Finally, the intentional activity we choose in order to further or bring about something good does not need to succeed in order to count as promotion (Ibid.). It is enough that we try. Thus, failed health promotion is still health promotion. Giving vitamin pills to one’s children can be regarded as promoting their health even if they make no positive difference (which might be the case if they already eat nutritious food). Thus, let me suggest a tentative definition of promotion. For A (where A can be an individual or a collective) to promote the X (some positive process or state of affairs) of B (where B can be an individual or a collective) is (by definition) for A to intentionally try to bring about, increase or maintain the X of B (where B can, but need not be, identical with A). We can, thus, promote, individually or collectively, not only health but many (good) things, e.g., democracy, global justice, gender equality, and human rights. Note that promotion might not only increase something that might already exist to some degree (e.g., raising a moderate level of quality of life to a higher level), but might also bring something into existence (e.g., helping illiterate people learn to read), and help maintain it (e.g., regularly working out in order to keep fit). This last point is important, since so much of what we call health promotion is directed at maintaining the health of the population. Prevention, as distinguished from promotion, has to do with stopping something from happening, usually something negative. And even if it does not seem contradictory to say that someone prevents something positive from happening, e.g., a malicious tyrant preventing the attainment of happiness in her people, I will stick to normal usage. Furthermore, prevention, like promotion, is an intentional activity, where intention, not success, matters. It can be performed by laypersons as well as professionals, and by individuals as well as by collectives. This gives us a structurally similar definition to that of promotion. For A (where A can be an individual or a collective) to prevent the Y (some negative process or state of affairs) of B (an individual or a collective) is (by definition) to intentionally try to stop, eliminate or postpone the emergence or development of Y (where B can, but need not be, identical with A). Thus, many (bad) things can be prevented, e.g., economic depression, unemployment, poverty and crime, and, of course, disease and illness. Note also that preventing does not necessarily mean forever stopping something negative from happening. Sometimes it just means postponing its onset. For example, exercising regularly and taking calcium tablets (with vitamin D) will rarely totally eliminate osteoporosis, but might postpone the onset of, or slow down, the deteriorating process . So, prevention includes postponing the onset of the bad state. Let us now continue by discussing the concept of disease.1 Disease will here primarily refer to internal processes of some negative kind (to be specified). But it will also include some internal states, or lesions, e.g., the lesions in the brain that are the results of strokes or brain infarcts, since some such states are often also considered to be diseases. There is an even broader conception that might include not only internal processes and lesions, but also injuries and defects (see  for definitions of these concepts, p. 109). Some writers call this group of processes and states “maladies” [10, 34]. But, even if injuries and defects also belong to those conditions that require attention from the health care sector and that entitle people to sickness benefits, as well as to those conditions that we want to prevent, we might not want to call them disease, as the concept will be used in relation to prevention. First, we also talk about injury prevention (including defects caused by injury) as a separate issue, and, second, we might not have the means to prevent all defects, some of which are inborn. Thus, I will use the more common, narrow, conception of disease, referring to processes and some internal states, while being aware of the fact that it might sometimes be reasonable to include other maladies in the definition. There are two major approaches to theories of disease (and disorder), one that (primarily) defines disease in terms of some internal (physiological, anatomical, or psychological) aberration or dysfunction [2, 3, 17, 51, 52], and another one that focuses on the harmful effects of disease (see below). There are also ways to combine these two aspects. We do not have the space here to go through all the theories of disease. The former kind of theory is probably the one that theoreticians have in mind when they talk about disease. It has, however, been thoroughly criticized (see [7, 8, 23, 30, 31, 34, 36, 37, 51], for detailed critiques of these positions). Let me just mention a few problems (see references above). The theory that claims that diseases are (statistical) dysfunctions of some organ or organ function that leads to a “biological disadvantage”, e.g., premature death or reduced reproductive capacity, has several problems. First, it does not allow statistically normal internal reactions to be diseases. Thus, a virus that causes severe suffering and disability in the majority of a population (be it a limited population or the world population) cannot be considered to cause a disease, since the reactions on the organ or functional level are statistically normal. This consequence is hard to accept. Second, many infections, typically recognized as diseases, do not lead to reduced survival or reduced reproductive capacity. On the contrary: for small children many infections are crucial in order for the child to strengthen her resistance. Third, there are also other conditions that have a holistic impact (in terms of suffering and disability) on individuals but where there is no obvious dysfunction, e.g., fibromyalgia, i.e., pain with no obvious internal cause (of a dysfunction type), or chronic fatigue syndrome. Still, many of these conditions are treated as diseases. As to the theory that considers disease (or disorder) as being reductions of evolutionarily generated functions that lead to harm to the individual, there are at least the following critical cases. It has been suggested that there are disease (or disorder) states that are not the reduction of evolutionarily evolved functions.2 One example is the reduction of the abilities to read, write and count. These abilities are exaptations, i.e., they were not selected for in the evolutionary process, and reductions of them are not, then, reductions of evolutionarily evolved functions, i.e., they are not diseases. Still, we consider them to be diseases. Secondly, a similar example is the “free rider problem” (Ibid.). Some organ in the body might just have evolved without having been selected for. It might have had no negative influence on survival or reproduction, and was therefore passed on from generation to generation. The appendix is said to be such an example. Now, any problem concerning such a free rider, say appendicitis, cannot be considered to be a disease (or disorder). Still, it is treated as such and has similar negative consequences (suffering and disability) as recognized diseases. Thirdly, some evolutionarily evolved reactions are themselves seen as being diseases, for example food poisoning. It is the normal, functional reaction of feeling queasy and throwing up, in order to get rid of the poisonous substance, that we consider to be the disease. No dysfunction is involved here. One further critical point can be made. We usually consider health as a dimension. This means that even for a healthy person we can improve health, e.g., from good health to excellent health. However, the theory of health as the absence of disease does not permit this. If you don’t have a disease you are healthy, period. This conclusion, then, contradicts our intuitions about health. Note that health promotion assumes that there is a positive dimension of health. If not, everything we do in order to preserve future health becomes disease prevention. To conclude, both these kinds of theories have counterintuitive consequences. Let us turn to a more useful theory of disease. Nordenfelt , Pörn , and others embrace the general idea that diseases are kinds of internal causes that typically reduce health. The idea in one (simplified) version goes like this: diseases are those kinds of (physical and mental) processes and states within people that typically cause ill health. Furthermore, the kinds of internal processes that (typically) increase the risk of future ill health, or premature death, also qualify as diseases . Note that the inner causal processes are unspecified, leaving it open how they work (which is an empirical question), and assuming that they might work in a variety of ways. This means that some of these processes (maybe even most) can be dysfunctions in one or both of the above-mentioned senses, but not all. For A (where A can be an individual or a collective) to prevent disease in B (where B can be an individual or a collective), is (by definition) for A to intentionally try to stop, eliminate or postpone the emergence or development of those (kinds of) internal processes and states that typically cause (manifest) ill health (i.e. suffering or reduced abilities), or future ill health and premature death, in B. According to the definition disease prevention involves both stopping external processes or states (that cause ill health) from negatively affecting the body or mind of the person, and hindering causal processes within the body or mind of the person that lead to ill health. A clarification is required. We will all fall ill and die of disease sooner or later. In light of this, preventing disease can mean several things. First, that we postpone death of one and the same disease, e.g., the cancer we die of will appear and kill us later than if the (external or internal) preventive actions had not been taken. Second, it might mean that when one disease is prevented we will fall ill or die, at some later stage, from another kind of disease. We prevent the cancer, but die from a heart-attack. Third, it might mean that we postpone or stop the onset of a disease, chronic or curable, that will not kill us but still reduce our health. The timeframe here has to be somewhat vague. However, “postpone” does not just refer to days or weeks, but rather to months and years. There are, at least, three kinds of conceptual theories of health: the medical, the holistic and the subjective. According to the first theory, health is the absence of disease, according to the second, health is ability, capacity, or holistic functioning, and according to the third, health is to feel well (in a certain sense). I have already (implicitly) criticized the first one. The idea of health as the absence of disease fails, since the theories discussed are not plausible theories of disease.3 The last two ideas are the most plausible. Both capture commonly recognized characteristics of health [13, 34, 36, 40, 44, 53, 54, 55]. Let me here suggest a two-dimensional theory of health, one that combines the holistic idea (health as functional ability) with that of subjective well-being. Lack of space only permits me to give some brief arguments for this choice (see  for details and more arguments). Why two dimensions and not one? That either of these two aspects of ill health are by themselves sufficient for having health is unlikely. There are cases where a person has reduced ability, but where suffering is absent. A person in a wheelchair might feel quite well, but still, of course, be unable to stand or walk. We might also find cases of suffering, say being downcast, but where the person is still able to function well (on a holistic level). So it appears we need a definition where both these aspects are taken into account. Two other things can be mentioned here. Most of the competing holistic theories see health as the ability of the individual to reach her goals in her environment [34, 40, 44, 53]. They differ in their conceptions of how those goals should be described and what the healthy person’s relation to the environment is. As opposed to these theories, the theory proposed here is not relativistic. It does not make the individuals’ personal goals (vital or not) part of health, since it might appear counterintuitive that changing one’s goals, to goals that are more easily attainable, would positively change one’s health. And, the theory, like that of Nordenfelt , but as opposed to those of Pörn  and Seedhouse , does not make the environment part of health either. This last strategy would make environment changes (in order to make it easier to reach desired goals) changes in health, and this clearly has counterintuitive consequences. For example, being in prison would, by definition, be a reduction of a person’s health (see  for more details). Now, according to the theory chosen, (positive) health is for a person (1) to have acquired the basic abilities and dispositions that people in her society typically acquire, usually in childhood and youth, and be able to use these abilities, given that the circumstances are acceptable, and (2) to experience health-related (subjective) well-being (see also [4, 5, 6, 8]. Note that all these basic abilities (typically developed by members in a society) come in degrees, i.e., they are dimensions, and, thus, so is health. A few clarifications are needed. First, basic abilities, as opposed to other more complex abilities, are the ones that one develops or acquires just by growing up and living in a society, and they do not require special training or education. Some examples of such abilities are being able to walk, run, stand, hold, sleep, talk, remember, reason, communicate, plan ahead, and understand the norms of the culture. To this we have to add some basic dispositions, such as being able to experience emotions, certain basic attitudes and states, such as having some degree of self-confidence and having a fairly correct perception of reality, some motivational force or drive, and the ability to acquire more complex abilities or competencies, such as driving a car and using a computer. Second, health-related well-being is the kind of well-being, consisting of either a mood or a bodily sensation that has its immediate cause within the person, e.g., feeling joyful or fit. There are other (non-health-related) kinds of well-being (or ill-being) with outer sustaining causes. Some of these are emotions, such as feeling happy, hopeful, angry or sad (because of some external event), others are sensations, like taste, smell, and touch, and, finally, some are “esthetic experiences”, like enjoying a musical. Thus, we have two (fairly complex) dimensions that taken together make up the dimension of health. At one end (of each of these dimensions) we have positive health, and at the other we have ill health. A state or process constitutes reduced health if it is a reduction of one or more basic abilities, and/or a reduction of health-related well-being (or increased suffering). To be healthy is to have acquired or developed the basic abilities (dispositions, etc.) that people in one’s community typically develop, to be able to “use” them, given that the circumstances are acceptable, and to feel well, because of immediate internal causes. This gives us a theory and definition of manifest health, i.e., health on the individual’s holistic level here and now. However, things are more complicated than this. Brülde [4, 5, 6], among others, has suggested that we need to differentiate between manifest and basic (or fundamental) health.4 The idea is that “below” the level of holistic functioning and experiencing, we also have an underlying psycho-physical level, where we can identify health. This is what we refer to when we speak about someone having a strong constitution, or resistance (to disease). This is related to the disposition over time of the individual to be able to act and to feel well, i.e., to have manifest health. The basic health of A is (by definition) those (non-conscious) states and processes within A’s body or mind (which are not themselves instances of manifest health) that support the manifest health of A. For A (where A can be an individual or a collective) to promote the health of B (where B can be an individual or a collective), is (by definition) for A to intentionally try to bring about, increase, or maintain B’s manifest health (i.e. her basic abilities or dispositions, etc., and her health-related well-being) and/or basic health (i.e. those internal physical and non-conscious mental states and processes that support manifest health). Increasing (manifest) health and reducing ill health, in the unhealthy population, are logically equivalent practices. This has to do with the fact that health is a continuum from optimal health to minimal health (see Fig. 1). Wherever you are on this continuous scale, an increase will (according to the definitions) count as an increase in health, and, thus, the activity to increase it will count as health promotion. This means that strategies directed at individuals, groups or populations with manifest ill health will count as health promotive. Thus, treatment and care are also health-promotive actions. This broad use of “promotion” is equivalent with Nordenfelt’s  concept of “health enhancement”. This inclusive notion, then, does not give us the tools to differentiate between health promotion with regard to healthy people, and the care, treatment and cure of people who are in states of ill health. This is, of course, compatible with some very loose aims sometimes proposed by theoreticians, for example that “health promotion refers to any measure designed to promote health” (Tones and Tilford in [43, p. 30], italics added). But treatment and care are not what professionals within the public health (and health promotion) field(s) are usually concerned with. Thus, the definition of health promotion, despite meeting some plausible requirements, is not sufficient for differentiating between the activities and aims of different professions, which is one important reason why we need our definitions. Health promotion, then (as part of public health, and as part of health promotion as a special profession), primarily deals with the healthy part of the population, i.e., group one, whereas treatment and care are directed at the unhealthy part of the population, i.e., group four. Working with groups two and three would normally be called disease prevention (primary and secondary prevention), and would also be of some concern for public health. Screening for various kinds of diseases would be one example. However, persons belonging to groups two and three often need some kind of treatment and will then be taken care of by the health care system. Sometimes, however, some (health promotive) changes suffice, e.g., changing “lifestyles”. Category five, finally, will rarely concern public health or health promotion, nor medicine in a narrow sense, but rather psychotherapy, counseling and pastoral counseling. For A (where A can be an individual or a collective) to promote the health of B (where B can be an individual or a collective), is (by definition) for A to intentionally try to increase, or maintain B’s basic abilities or dispositions (etc. ), and/or (health-related) well-being, and/or fundamental (non-conscious) psycho-physical states and processes, where B is healthy, or where (when unhealthy) the actions focus on the healthy “features” of B. As to disease prevention, we have to keep in mind that we are here primarily concerned with what is often called “primary prevention”, i.e., preventing disease from occurring in the healthy, or at least, asymptomatic, population. Health Promotion and Disease Prevention, Are They Logically Different Practices? Two important things stand out in the analysis. The first is that health and disease are logically different notions, although causally linked, and, the second is that there are two different aspects of health, manifest health and basic health. Let us now draw some (logical) conclusions from the definitions stated in the previous sections. We can promote (manifest) health without reducing disease. Through health promotive actions we can increase health (in the healthy population). When we prevent disease we only stop manifest health from deteriorating. Preventing (future) disease in a population necessarily reduces (future) ill health in the population. Most of the future gains in manifest health are made through preventing disease. We can increase manifest health without increasing basic health, but not vice versa. Most instances of basic health and disease exist on the same ontological level. This means that most disease preventive actions at the same time promote basic health, and most instances of promoting basic health are disease preventive (in the long run). some increases in basic health, and some ways of maintaining it, are not reductions of present or future disease, i.e., we can (sometimes) increase basic health without preventing disease, and vice versa. 1. We can promote (manifest) health without reducing disease. We can enhance manifest health, i.e., increase health-related well-being or basic abilities, without necessarily preventing future disease. Let us say that rationality is part of mental health. Increasing people’s rationality would then count as an increase in health. It is hard, however, to imagine that this will necessarily reduce the risk of future disease (mental or physical). The same can be said of other abilities and dispositions, for example memory and creativity, and making someone feel more confident or psychologically secure does not necessarily prevent future disease. To take an example concerning physical health: A person might increase her agility without this necessarily preventing future disease. So, even if there are plenty of examples where enhancing manifest health actually does lead to reduced disease, we can find many instances where this is not the case. 2. Through health promotive actions we can increase health. When we prevent disease we only stop manifest health from deteriorating. Promoting health in the healthy individual or population does not only maintain health, but can also increase it, whereas preventing disease can only help maintain manifest health. Adding vitamins or minerals, or social capital or sense of coherence, or providing sports facilities or green areas, can increase manifest health. But eliminating a possible negative (external or internal) causal factor, e.g., a genetic defect (if possible) or a potentially harmful pesticide, and thus eliminating a possible (future) reduction of health, can never increase people’s abilities or well-being. In other words, preventing disease will help maintain (manifest) health in the healthy population, but it can never enhance it. 3. Preventing (future) disease in a population necessarily reduces (future) ill health in the population. As the definition indicates, diseases are states or processes that cause ill health, i.e., reduce abilities and/or create suffering. Thus, every disease-preventive program, if successful, will reduce future manifest ill health (by helping maintain health). For example, vaccinating children against polio is preventing a possible disease, and this will, at the same time, help maintain future manifest health in these children. So, disease prevention is prevention of ill health, and thereby it is one aspect of health promotion. 4. Most of the future gains in manifest health are made through preventing disease. Since the overwhelming majority of cases of manifest ill health are caused by diseases (or maladies), this means that attempts to hinder diseases will (if successful) always, sooner or later, have positive effects on the manifest health of a population through helping maintain it. Obviously, diseases like cancer, cardiovascular disease, diabetes, allergies, asthma, schizophrenia, etc., are the major causes of ill health. However, we should remember that some states of ill health are caused by other factors, such as personal crises. And, of course, as pointed out above, we can improve health in healthy individuals without this having to do with disease prevention. 5. We can increase manifest health without increasing basic health, but not vice versa. For example, if we increase our capacity to concentrate for longer periods of time we do not thereby (necessarily) increase our basic mental health. This is especially so when we are in the upper part of the “dimension”. For example, slightly improving a person’s ability to reason, from very good to excellent, is not likely to increase the person’s basic health, since it does not necessarily change any more fundamental psychological process or state (e.g., strengthen self-esteem or increase stress resilience). Adding caffeine and ginseng to one’s diet might also increase one’s manifest health, without necessarily increasing one’s basic health. On the contrary, some such (manifest) health-enhancing substances might even cause harm to the basic health. Amphetamine might improve perseverance and the ability to concentrate, and, thus, manifest health, but in the long run it will ruin the person’s basic health. It is of course (for conceptual reasons) impossible to find (general) examples of increased basic health where this does not in the long run benefit manifest health. This is a result of the definitions used: Basic health is those states and processes within the individual that support manifest health. 6. Most instances of basic health and disease exist on the same ontological level. This means that most disease-preventive actions at the same time promote basic health, and most instances of promoting basic health are disease preventive (in the long run). Although basic health and disease are conceptually distinct, there are few examples where we increase the basic health of an individual without thereby reducing the risk of future disease, and the other way around. The point, for example, of getting enough vitamins and minerals is that it is both crucial for our manifest health, and necessary in order not to develop deficiency diseases. Likewise, strengthening the basic processes or structures within the body, e.g., heart and lung capacity or the skeleton, through exercise, has the same effects. It supports manifest health (ability and well-being), and, at the same time, reduces the risk of, for example, arteriosclerosis, osteoporosis, and cancer. 7. We can sometimes improve basic health without preventing disease, and vice versa. It seems possible to find at least some examples where a strengthening of the person’s basic health is not at the same time a reduction of a future disease. The examples mainly come from mental health (and from the positive side of the dimension). It is, for example, unlikely that experiencing an increased sense of self-esteem or a deep sense of worth, or developing an improved resilience to stress, will necessarily reduce future cases of disease, i.e., the underlying causes of, for example, schizophrenia, dementia, heart disease or asthma. Moreover, if we consider a certain degree of elasticity of the tendons as belonging to basic health, then we could argue that increasing the elasticity increases basic health (since it is one foundation for holistic abilities, e.g., to bend), while it is not a reduction of (present or future) disease (or malady). Finally, infections typically reduce manifest health and, thus, qualify as diseases. Stopping an infection is, thus, preventing a disease. However, unless they are lethal, infections do not seem to decrease basic health (and if they do so it is only temporary). On the contrary, in the long run, infections (when fought off) in general increase basic health, as they strengthen the person’s immune defense. The general conclusion is that even if health promotion and disease prevention are logically distinct notions, they are, however, conceptually linked. Disease cannot be viewed independently from health, since diseases are those kinds of states and processes within a person that typically compromise (manifest) health. One cannot, then, prevent disease, in general, without furthering or maintaining health. Moreover, even if it is possible to promote manifest health without preventing disease, it is usually the case that when we promote health we also prevent disease. We also saw that there is an important distinction between manifest and basic health, and here we need a further discussion about which of these “levels” different interventions target. To conclude, even if promoting basic health and preventing disease are conceptually distinct practices, these practices usually achieve the same thing. However, the major reason for trying to differentiate health promotion from disease prevention might be the choice of strategy. Many health-promotive strategies are “broad” and are not targeted at specific diseases (or specific health gains), but at general health enhancement, both basic and manifest, and at disease reduction in general. One example of this is the recommendation to increase physical activity. Most disease-preventive interventions, however, target specific diseases, as in vaccination or screening programs.10 Choosing strategies is, perhaps, the most critical and conflict-laden issue here. Should we use paternalistic top-down strategies, which is often the case with disease-preventive strategies, or should we choose participatory bottom-up strategies, which is often the case with health-promotive strategies? This is an important political and ethical question, which is, however, outside the scope of this paper (see, for example, [9, 16]). Given that health promotion and disease prevention are logically distinct, another important question (among several) remains, namely to see if different kinds of interventions lead to (partly) different goals, increased or maintained health or reduced incidence of disease. We would also like to know to what extent health promoting strategies lead to manifest or to basic health gains. These questions cannot be answered here either, but are the topics for another, forthcoming paper that takes its departure in the conceptual discussion in this one . For criteria governing such a discussion see [7, 8]. Note that  does not discuss disease but disorder. It is clear, however, that these concepts can have the same function. Were we to find a more plausible theory of disease we could perhaps pursue this path. However, the alternative theory of disease proposed in this paper has another relation to health. The idea is found already in Galen’s  writings. Most likely something also happens on the level of basic health. Note that a specific instance of manifest health, which helps support some other instance of manifest health, will not count as basic health, e.g., regularly walk the stairs, and thereby enhancing one’s general fitness, does not make the ability to walk the stairs an instance of basic health. We could perhaps also add as a separate group those people who are healthy, and do not have a disease, but have some kind of increased risk, e.g., non-exercisers and smokers. They would of course also be of concern for public health. Sometimes we find that whole communities are in poor states of manifest health. Supporting these people to gain health should probably also count as health promotion, unless the measures used are narrowly medical (and will, thus, count as treatment or care). Providing nutritious and sufficient food for the population would probably count as health promotion, whereas treating a population with antibiotics would not. It is likely that here too we need other distinctions in order to prevent disease prevention collapsing into treatment. This can no doubt be done. I will, however, not pursue this issue here. However, some disease preventive programs might have positive effects on many diseases. Smoking cessation programs might target reduced lung cancer, but will in effect also reduce a number of other diseases where smoking is a contributing cause. I would like to thank Lennart Nordenfelt, Bengt Brülde, Peter Korp, Karin Dahlbäck, the anonymous reviewer, and the participants of “the higher seminar” at IHS, Linköping University, Sweden, for valuable comments on earlier versions of this paper. Läkemedelsverket [Medical products agency, in Sweden]. (2008). http://www.lakemedelsverket.se/Tpl/RecommendationsPage_2989.aspx 2008-10-17. Nutbeam, D. On behalf of the WHO (1998). Health promotion glossary. WHO/HPR/HEP/98/1. (See also: http://www.who.int/hpr/NPH/docs/hp_glossary_en.pdf). Tengland, P.-A. (2009). Health promotion and disease prevention: A real difference for public health practice. Health Care Analysis. doi: 10.1007/s10728-009-0124-1.